The better we get to know Stadler, and in particular their 4AllPro suit, the more impressed we become. As far as we’re concerned, the two best road suits on the market are the Rukka Nivala and the Stadler 4All Pro. The Nivala is in a different league to anything else that comes out of the Finnish stable. And frankly, if you really want to wear a big ‘R’ on your back, pay the extra and go for the Nivala. It’s incredibly comfortable to wear, it’s the best vented Rukka suit ever, and it’s the warmest motorcycle suit you’ll ever own. In fact, if you commute all through the winter, we’d probably recommend the Rukka over the Stadler; although we’ll qualify that statement a bit later. But the Rukka is heavy, and it’s nowhere near as well vented as the Stadler, so if you’re looking for a suit that’s going to be equally impressive in the summer months, and for overseas touring, the balance swings very much in the favour of the Stadler, in our view. If you were to try on the Nivala and the 4All Pro, back to back, in all probability you would find the Rukka more comfortable. Both the jacket and pants are infused with a stretch component. They fit superbly although, in our experience, you would probably want to go one size down on any other suit. So if you’re a 56 in anything else, you’ll probably be a 54 in the Nivala. You can wear it almost leather-suit tight because the stretch material gives you all the movement you’ll need or want. Put the separately-worn duvet-style inners on, and it’s still most unlikely that it’ll make a difference to the sizing. The Stadler suit is not uncomfortable, but it uses stretch panels rather than stretch throughout to achieve its fit. Mr Stadler thinks this makes the suit stronger. With it’s Gore-Tex Pro Shell, the Stadler feels a bit crispier. And on some people, the arm holes can feel a bit tight. The Stadler trousers, though, are particularly nice to wear. They’re lighter and easier to wear than the Rukka pants. They’re nice to walk around in, and in the summer the riding experience will be much more comfortable. On the subject of sizing and fit, we’d have to say that even if the Nivala is marginally more comfortable, the Rukka won’t work on everybody. The Stadler has a much larger range of trouser sizes and leg lengths, for example, than the Rukka. 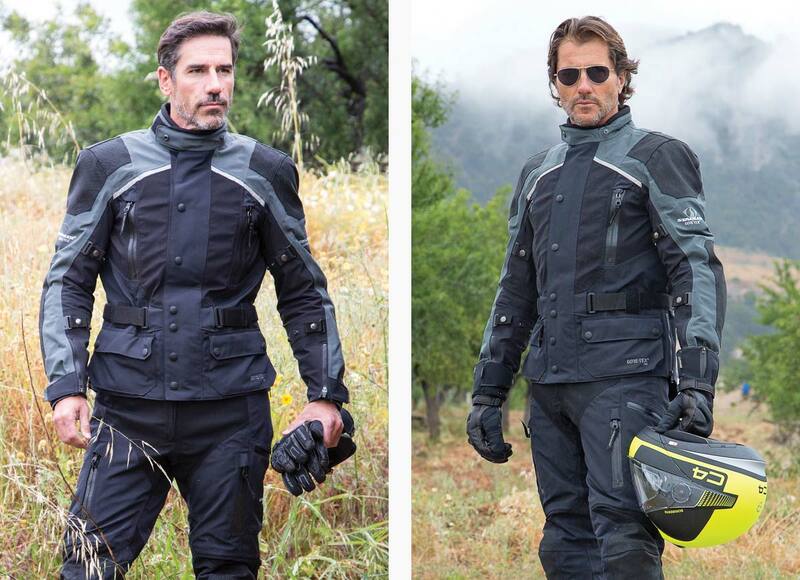 But uniquely in the world of textile motorcycle clothing, with the Stadler, we can offer a custom fit. Perhaps two inches extra in the length of the jacket if you’re tall in the upper body. Shorter or longer sleeves. It can all be done, and normally at no extra cost. One of the reasons we don’t think the Stadler is as good as the Rukka for winter riding is that the Stadler’s thermal liner is pretty rubbish. The reason for this is that the Germans, with typical teutonic discipline, simply don’t ride in the winter. The steel wheels go on the car, and the bike gets consigned to the garage. But whereas you will never be able to make the Nivala nice to wear in the warmest weather, you can easily make the 4All Pro work in the winter. All you need is to replace the thermal lining with something better. 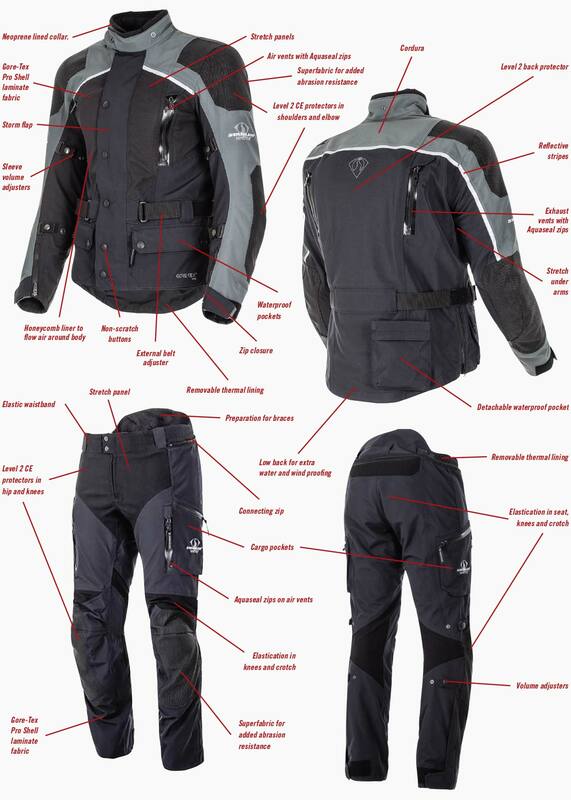 Now this is a bit cheeky, but what we would do is buy the Rukka Down-X jacket and pant liners, and then throw away the inners that come as standard in the Stadler. Do this, and we reckon you’d pretty much have the gold standard for all-year-round, four-season riding. As far as waterproofing is concerned, you’ll find there’s not much to choose between the two. Both use Gore-Tex’s Pro-Shell, 3-layer laminate construction. The Stadler has an external and internal storm flap; the Rukka only has an internal one. The reality is that waterproofing doesn’t get any better. Neither jacket will ‘wet out’, and both will dry out quickly after a downpour. When you buy a suit at this level, you expect to be buying safety and protection, and you do. But in this regard, we think the Stadler starts to draw ahead. In the key abrasion areas, the Stadler suit employs Superfabric, the most abrasion resistant material you can use on a riding suit. Rukka used to use it on their old Arma S suit, but the price caused them to drop it. This didn’t, by the way, make the ArmaS a great suit, contrary to what you may read on some forums. We never really liked it. It may have been protective, but it was just about the least comfortable riding suit ever produced. It was also almost totally devoid of venting. And it was equipped with the stiffest and most unreliable front zip ever invented! In terms of impact protection, as opposed to abrasion resistance, the Stadler is also better endowed than the Rukka but, as ever, the advantage comes at a slight cost of comfort. The Nivala, as is the case with all Rukka suits, comes fitted with D3O armour. Everybody loves D3O, although disappointingly the back protector in the Nivala is only Level 1. Now the armour in the Stadler feels a touch agricultural by comparison. We discussed this with Mr Stadler a while ago, and he has supplied us with softer armour for those who require it. There’s no cost to do this. But Stadler supplies 100% of the German police forces, and for the guys who sometimes have to chase down the Autobahn at insane speeds, safety is all. And that’s why Stadler prefers to stick with its own armour, which not only meets the highest Level 2 standard, but exceeds it by up to 60%. Every rider, of course, has his own priorities, so we’ll fit whichever armour you want. We can even put D3O in the suit if you prefer. Again, we wouldn’t charge extra. On the subject of protection and what might happen in an accident, you might be interested to know that if you damage your Stadler in an off, it can be repaired at the factory. They can essentially re-make the jacket, making sure also that it’s just as waterproof as it was before the incident. Rukka’s gear is made in China, so this is not an option with the Finnish brand. Now, earlier on, we stated that the Stadler suit performed better than the Rukka in hot weather. And it does. The reason it does is partially down to the huge vents on the chest and back. A total of four six inch openings are protected by totally waterproof zips. But actually, the vents are only part of the story. It’s what makes the vents so effective that sets the Stadler apart. Inside the vents there’s a lining made from uncrushable, 3D piping that literally channels air all around the body and out the rear exhaust vents. Often on a suit, the oncoming air goes nowhere because it flattens the front of the jacket. It never actually reaches the interior, but that doesn’t happen with the Stadler. If you’re looking to stay cool, the Stadler is quite simply the superior bit of kit. One of the stand-out features when you buy a Rukka is the six year warranty. Well, Stadler trumps that with an industry-leading 10 years. Like other warranties, what you’re being protected from is faulty manufacture and not wear and tear. But if your jacket starts to leak in nine years’ time, you can still expect Stadler to repair it. Which brings us finally to pricing. At this end of the market, the difference in prices between the Rukka and Stadler might not be the deciding factor. And if one outfit suits your needs better than the other, or if one is more comfortable, that’s probably going to be more of a consideration than the price differential. In fact, the main reason we feel a need to talk about pricing at all is that some people equate price with quality, and by that criteria the Rukka, to some, may appear a better suit. But in Germany, the difference in price between the Rukka and the Stadler is very marginal. However, there is quite a disparity when the products make it into the UK, and that’s because Rukka is imported into the country by a distributor, whereas we buy Stadler direct from the factory. A distributor will often add 25%, 30%, or even more, to the price of a product. So, in the UK, a Nivala jacket costs £1,200 against the Stadler’s £925. That’s a premium of about 30%. The extra £175 you pay for the Nivala pant over the Stadler pant represents a premium of 26%. All we can say is that, in this instance, paying more doesn’t get you more. The extra cost is accounted for by a middle man. The final point we should make on pricing and affordability is that, with the help of the factory, we can offer 36 months interest-free credit on the Stadler. We can offer two years on the Rukka, but three years’ interest free is pretty much unprecedented in the motorcycle clothing world. Let’s put it like this, a Stadler jacket and pant will come in at £1,600. You’d pay a deposit of £160, then 36 payments of just £40. And when that’s paid off, you’d still have a suit with a guaranteed seven years mileage still left in it. This seems to us to be a bit of a no-brainer. If you’re a serious motorcyclist and really want to avail yourself of the highest levels of protection, not only from the elements, but also other road users and the black stuff, less than £10 a week doesn’t seem to us to be a lot to pay for the privilege. In closing, let us summarise. The Rukka is brilliant; it’s the best Rukka ever, and is easily worth the premium over any other suit in the Rukka range. It’s pretty much as waterproof as a motorcycle suit gets. It’s amazingly comfortable, and particularly warm in the colder months. For some, the deciding factor will be the immediately recognisable ‘R’ on the back. The Stadler is not so instantly comfortable. It’s every bit as waterproof as the Rukka; in the margin perhaps even more so. The thermal liner is a bit pants, although that’s not difficult to put right. But the Stadler is a more protective suit, as it comes with Superfabric and armour that easily exceeds the Level 2 standard. When it’s really hot, you don’t want to ride in a Rukka. The venting in the Stadler, by contrast, means that it’s better vented than anything this side of a mesh suit. It’s got an amazing warranty and, unlike the Rukka, can be repaired if you go down the road. The Stadler costs £1,600, compared to Rukka’s £2,050. We love both suits, and if your emphasis is on winter commuting, we’d probably go for the Rukka, although if you fitted the 4All Pro with the Nivala’s inner lining, the Stadler would be just as good. However, if you want to throw in some summer European touring, then in our book it would have to be the Stadler all day long. As we have already suggested, the gold standard, in our view, would be the Stadler suit fitted with Rukka’s duck-down liners. Then you’d almost certainly have the best suit in the world. If you’re seriously interested in either suit, we would recommend a visit for a fitting, because often fit is what it comes down to. We’ve got just about every Nivala size permanently in stock, but with its stretch fabric we reckon it’s easy to get the sizing wrong, so it’s important to try it on in different sizes. We’d want you to sit on our showroom bike to make sure the chest, sleeve-lengths, waist and trouser leg are just right. It’s a lot of money, so you would want to get it right. The some applies to Stadler, but probably even more so, especially if we’re talking about bespoke alterations. You can’t go wrong with either suit; but from a purely functional perspective, we’d have to say that the Stadler edges it. Come and see us soon, and see what you think.